Whilst out on my regular morning walk a few days ago, multiple fish were leaping out of the water. It was like an official leaping fish convention! It was incredible to see. It got me thinking, if fish can take the leap, literally leaping, into the unknown and out of their comfort zone, why can’t we? They leap from water where they are safe and can breathe, up into the air and the sunshine where they cannot breathe - yet they do it. Is it for the exhilaration? Is it because they’re dared to do it? How do they overcome their fear? Do fish even feel fear? The Oxford English Dictionary defines fear as “An unpleasant emotion caused by the threat of danger, pain, or harm (noun)”. We all have fears. Fear is a normal part of life. It is a physical thing. We feel fear in our bodies as a physical response to a situation, real or imagined. Many of our fears are real and genuine based on the world we live in and things that can go wrong. However, many of our fears are created in our minds. They are not based on reality about what will happen to us. Instead they are fabricated versions of what we worry may happen to us. Sadly, these fears can be debilitating and still result in a physical response. What was biologically necessary to preserve our life from genuine danger, has been turned into something that inhibits us from living our life most fully. Fears can stop us from pursuing things that we feel passionate about. They can prevent us being the sort of person we wish to be. Fears can influence and limit their choices and decisions we make. Fear can prevent us from experiencing true happiness and joy. Which is why it’s important we consider addressing our fears. 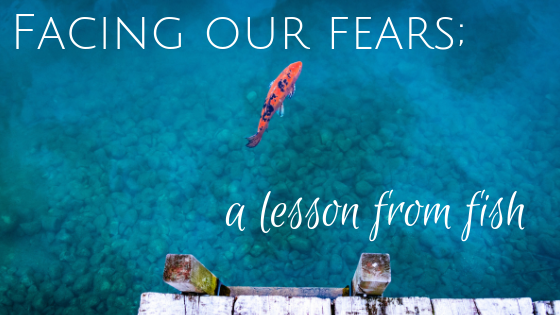 It can be very daunting to think about facing a fear, and can bring about even more fear. Fear of not being unable to change, fear of not being good enough, fear what others will say/think/feel, and so on. Yet when we overcome a fear, the learning and exhilaration is unmatched. It’s fantastic to achieve things and feel the sense of satisfaction from accomplishing a goal or a dream. When we overcome our fear, move past it and doing something we thought was previously impossible; that is truly life transforming. As we know, fear is a physical thing. And therefore the best way to overcome fear is to do something physical in response. Something that pushes you hard to get your blood pumping. For me that often looks like going for a brisk walk or gentle run, or doing an occasional workout. Alternatively, it could be pushing yourself to run for the bus, or even taking the stairs instead of the lift. For the fish, perhaps leaping out of the water is their way of overcoming the very fear of taking the leap in the first place! As I watched the leaping fish, there was a flash as the sunlight caught their silver scales, a small splash after they landed and then they were gone. It all happened in a matter of seconds. But the ripples resulting from the leap lasted far longer, and could still be seen for some minutes, disturbing the smooth surface of the water. Similarly, like the fish, when we take action there are ripples. The ripples then continue through our life. Why? Because action is energy. When we take action towards our fear, it is an energetic shift. You may be familiar with this, as when we take action in one area of our life and make the changes we have been dreaming off, there is a flow on effect. Many of my clients have shared that when they have started taking action on one area of their life, other areas start to improve too. Thus, one small action can have greater consequences and benefits than first envisaged. Which brings me back to the fish, again. All I really know is that they were taking a leap, taking action and making it happen. Are fears and regrets holding you back from living the life you desire? If so, you need my new No Regrets Tribe Beta Course! It’s a 5-week, small group course to support you address 5 of the top regrets people have about their life, including support to so you can choose to be brave and live the life you want. You can learn more and register your interest below.